Once you find yourself affected by the landscaping and gardening bug there really is no turning back and fortunately there’s a whole cyber universe out there that can help you with that. There are hundreds of sites that you can use as tools to make your green thumb a little greener and to expand your knowledge in general. The first time I saw a robot lawn mower I was taken aback by how efficient it could make our lives. Just imagine sitting back and drinking a glass of lemonade while enjoying a warm summer day, watching a robot cut your lawn. There’s something a little bit romantic about a riding lawn mower – at least there is for someone who loves power equipment they can drive. 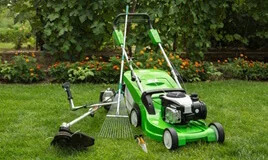 They’re powerful little machines that make cutting a large lawn as easy as it is cutting a small one with a push mower.